Educational Qualification: HS Passed with type writing in English and Assamese. 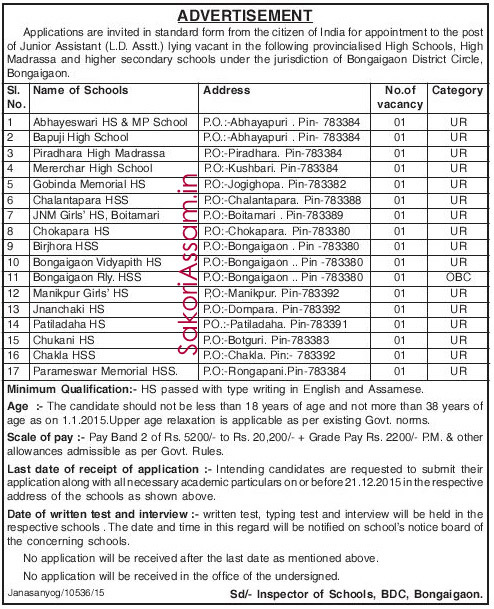 Last Date of Application: Intending candidates are requested to submit their application along with all necessary academic particulars on or before 21.12.2015 in the respective address of the schools as shown in the official advertisement. Date of written test and Interview: written test, typing test and interview will be held in the respective schools. The date and time in this regard will be notified on school’s notice board of the concerning schools.